Congress is getting closer and closer to a potential vote on DACA that could lay out a path to citizenship for hundreds of thousands of immigrants who came to the United States as children through no fault of their own. House Republican moderates say they have enough support to force a full House vote on legislation to protect undocumented immigrants brought here as children, as tensions between them and House GOP leaders continued to escalate on Thursday. A coalition of GOP centrists led by Reps. Carlos Curbelo (R-FL) and Jeff Denham (R-CA) are sick and tired of waiting for leaders refusing to move on a fix for the Deferred Action for Childhood Arrivals (DACA) program. And they’re just four GOP signatories away from being able to force a full House vote on a solution, assuming all House Democrats join them in support. “I have more than enough signatures for the discharge petition,” he said. House Majority Leader Kevin McCarthy is trying to scare Republicans into compliance by telling them that a DACA vote will cost the GOP its House Majority in November. This argument doesn’t appear to be working, as Politico reports; seeing as how there are already dozens of reasons why Republican might lose the House in 2018, singling out DACA as a political bogeyman is a pretty weak arm-twisting maneuver. 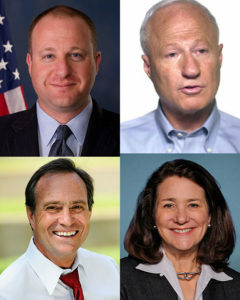 Four members of Colorado’s Congressional delegation have signed onto the discharge petition: Rep. Diana DeGette (D-Denver), Rep. Jared Polis (D-Boulder), Rep. Mike Coffman (R-Aurora), and Rep. Ed Perlmutter (D-Jefferson County). Coffman's Hail Mary. House leadership putting a torpedo into this legislation isn't going to help him. Saying you are for it and working to get it passed are two different choices. Will be interesting to see how this plays out like Net Neutrality being upheld in the Senate. Coffman will definitely vote for this, work to get it passed. He said so. At least twice. I admit, DACA discharge with Rep. Coffman's name on it is going further than I expected. Even if the discharge petition DOES work, the multiple bills may not get a majority for any one. And if something does pass the House, I have a hard time seeing how Sen. McConnell will allow it to come before the busy Senate any time soon; and if it did, that anything from the House will be able to garner sufficient support to pass the Senate. And although trying to guess *resident Trump's response is more challenging than ever, I don't think he'd sign it, even if it DID get him his fabulous wall. Coffman does something else that will have no actual success or impact. On balance, I think his stance will help him in November. Agree, John. He can run as an independent Republican who got DACA to the floor, and voted to save Obamacare – after Ryan gave him a dispensation to do so. The Senate already held a similar vote, but under the rules of the vote nothing advanced because nothing hit a 60-vote threshold. Two of the House proposals already have simple majority support in the Senate: the straight-up DREAM Act, which passed 52-47, and the USA Act (the compromise moderate bill) which got 55 votes.